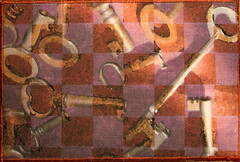 I had two same sized images of the same set of keys portrayed quite differently, and I was trying to think of a way to combine them. So I cut them into strips and wove them together. I love the way the watercolor texture plays back and forth with the regular metal-and-fabric texture, and how you can't quite forcus on any one piece at a time without sort of seeing both. I also managed to finish my January Journal Quilt page, with mixed results. I like the general thing, but it is kind of crammed with incident. There is all kinds of stuff just glued on. I tried hard not to over-think it, and I may have erred on the side of failing to plan at all. I was so wowed by the amount of space I had (after 4x6 it felt huge!) that I had to work hard to keep things off it. But, but, but... I needed to include the river, and the house, and the husband (and how rooted he is in this Valley) and the kids, and the desperate wish for a horse, and the things I'd managed to finish in January (all those postcards with keys and circles) and I wanted to keep the background I'd made, and I put a boat on it already so I had to cover it up, and -- you can start to see some of my problems. The closeups are over on Flickr here, here and here. I'm thinking about maybe making Feb a little cleaner. Or maybe planning it out a little more. But if I think too hard, I get pinned, and then paralyzed, and really these are not tests, just practice for the next piece. You make more good stuff, we all make more good stuff, if we just make more stuff, and practice our making chops, so to speak. Good stuff comes. With practice, it comes more often. With volume, more stuff comes, and even if the same percent is good, you get more. Plus you get the joy of doing, which is substantial.